Home » FAST TRACK FDA » TIDEGLUSIB ..An NSAID and neuroprotective agent. TIDEGLUSIB ..An NSAID and neuroprotective agent. Tideglusib (NP-12, NP031112) is a potent, selective and irreversible small molecule non-ATP-competitive GSK3 inhibitor that has been investigated as a potential treatment for Alzheimer’s disease and paralysis supranuclear palsy in Phase IIa and IIb clinical trials. The first clinical trial conducted with tideglusib to be published (in English, at least) was phase II and demonstrated that overall tideglusib was well tolerated, except for some moderate, asymptomatic, fully reversible increases in liver enzymes (≥2.5xULN; where ULN=Upper Limit of Normal). 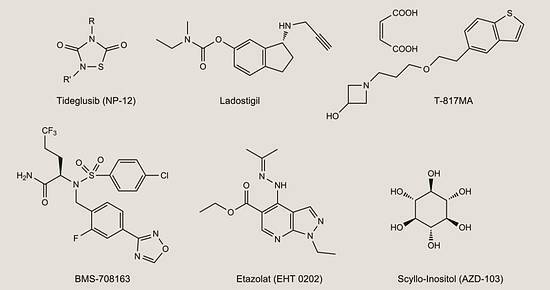 NP-031112 is an inhibitor of glycogen synthase kinase-3 beta (GSK-3beta) in early clinical development for the oral treatment of Alzheimer’s disease. The compound had been in phase II clinical trials for the treatment of progressive supranuclear palsy and for the treatment of Alzheimer’s disease; however the development was discontinued in 2011 and 2012 respectively, due to lack of efficacy. The neuroprotective effects demonstrated in animal studies have also suggested its potential use in stroke and other brain disorders. It is being developed by Noscira (formerly known as NeuroPharma). In 2009, orphan drug designation was received in the E.U. and the U.S. for the treatment of progressive supranuclear palsy. In 2010, fast track designation was assigned in the U.S. by Noscira for this indication. Overexpression of GSK-3 leads to hyperphosphorylation of the tau protein, an anomaly which occurs in a number of neurodegenerative diseases known collectively as tauopathies, which include Alzheimer’s disease (AD), Progressive Supranuclear Palsy (PSP) and Pick disease. NP-12 is a GSK-3 inhibitor with oral bioavailability and great therapeutic potential as a disease-modifying treatment for Alzheimer’s. NP-12 is currently undergoing clinical trials for Alzheimer’s disease in the EU. NP-12, the only GSK-3 inhibitor under clinical development for AD, has proven to be capable of acting on all of the histopathological lesions associated with the disease in experimental models: it reduces phosphorylation of the tau protein and hippocampal and entorhinal cortex neuron loss, improves spatial memory deficits and significantly reduces the accumulation of amyloid plaques in the brain. NP-12 also provides neuroprotection in vivo and has a potent anti-inflammatory effect in a range of animal models. PSP is a neurodegenerative disease characterized by oculomotor disturbances, specifically difficulties in moving the eye vertically, falling down and Parkinsonian symptoms. The disease affects an estimated 5-6.4 out of every 100,000 people. There is currently no treatment capable of delaying or altering the progression of the illness. Domínguez, JM; Fuertes, A; Orozco, L; del Monte-Millán, M; Delgado, E; Medina, M (January 2012). “Evidence for Irreversible Inhibition of Glycogen Synthase Kinase-3 by Tideglusib”. The Journal of Biological Chemistry 287 (2): 893–904.doi:10.1074/jbc.M111.306472. PMC 3256883. PMID 22102280. Teodoro Del Ser (2010). “Phase IIa clinical trial on Alzheimer’s disease with NP12, a GSK3 inhibitor”. Alzheimer’s & Dementia 6 (4): S147. doi:10.1016/j.jalz.2010.05.455. Eldar-Finkelman, H; Martinez, A (2011). “GSK-3 Inhibitors: Preclinical and Clinical Focus on CNS”. Frontiers in Molecular Neuroscience 4: 32.doi:10.3389/fnmol.2011.00032. PMC 3204427. PMID 22065134. Del Ser, T; Steinwachs, KC; Gertz, HJ; Andrés, MV; Gómez-Carrillo, B; Medina, M; Vericat, JA; Redondo, P et al. (2013). “Treatment of Alzheimer’s disease with the GSK-3 inhibitor tideglusib: A pilot study”. Journal of Alzheimer’s disease 33 (1): 205–15.doi:10.3233/JAD-2012-120805. PMID 22936007. “FDA Grants Fast Track Status to Tideglusib (ZentylorTM) for Progressive Supranuclear Palsy”. PR Newswire Europe Including UK Disclose. 10 September 2010. Retrieved 11 August 2013. Dominguez, JM; Fuertes, A; Orozco, L; Del Monte-Millan, M; Delgado, E; Medina, M (2011). “Evidence for Irreversible Inhibition of Glycogen Synthase Kinase-3 by Tideglusib”. Journal of Biological Chemistry 287 (2): 893–904.doi:10.1074/jbc.M111.306472. PMC 3256883. PMID 22102280. Evidence for irreversible inhibition of glycogen synthase kinase-3β by tideglusib. Domínguez JM, Fuertes A, Orozco L, del Monte-Millán M, Delgado E, Medina M.
Chemistry”, J. Heterocyclic Chem., 1984, 21, 241-246. For example, sulfuryl chloride is added dropwise with stirring, under nitrogen atmosphere, preferably at low temperature, preferably at about 5 °C, to a solution of benzyl isothiocyanate and the isocyanate indicated in each case, in a suitable solvent such as hexane, ether or THF. When the addition is finished, the mixture is left to react, for example by stirring for 20 hours at room temperature. After this time, the resulting product is isolated by conventional methods such as suction filtration or solvent evaporation and then, the purification is performed (e.g. by recristallization or silica gel column chromatography using the appropriate eluent). Other alternative procedures will be apparent to the person skilled in the art, such as the use of any other chlorinating agent instead of sulfuryl chloride, variations in the order of addition of the reactants and reaction conditions (solvents, temperature, etc). 1H-RMN (CDC13): 4.9 (s, 2H, CH2PI1); 7.3-7.9 (m, 12Η, arom.) 13C-RMN (CDCI3): 46.5 (CH2Ph); 128.3; 128.6; 129.0; 135.0 (C arom, Ph); 122.0; 125.3; 126.8; 127.2; 127.5; 128.5; 130.8; 134.4 (C arom, naphthyl); 152.2 (3-00); 165.9 (5- C=O). Sulfuryl chloride is added dropwise with stirring, under nitrogen atmosphere, at 5 °C to a solution of benzyl isothiocyanate and the isocyanate indicated in each case, in hexane, ether or THF. When the addition is finished, the mixture is stirred for 20 hours at room temperature. After this time, the resulting product is isolated by suction filtration or by solvent evaporation and then, the purification is performed by recristallization or silica gel column chromatography using the appropriate eluent. More details can be found in Slomczynska, U.; Barany, G., “Efficient Synthesis of l,2,4-Dithiazolidine-3,5-diones (Dithiasuccinoyl-amines) and observations on formation of l,2,4-Thiadiazolidine-3,5-dione by related Chemistry”, J Heterocyclic Client., 1984, 21, 241-246. By DR ANTHONY MELVIN CRASTO Ph.D in FAST TRACK FDA, Uncategorized on January 10, 2014 .